Burano island Venice arises on four islands of the lagoon and it is connected through a bridge to Mazzorbo island. The tradition tells that Burano island was founded, as the surroundings, by the citizens of the roman town Altino, who took refuge in the lagoon to escape to the barbaric invasions, particularly from Attila the Hun and the Longobards. Burano, one of a kind. The first houses were built on pile dwelling with walls made of canes and mud and just since the year 1000 they were built with bricks. Burano was an island with a nice and healthy weather and thanks to the wind it kept malaria disease far of it. Through the centuries, some families of this island moved to Ancona due to work. Over there they built a small community called Buraneli. You can still hear today this through the dialect spoken in Ancona. The houses in Burano island have an intense color so the boatmen could find their home with the fog. The center of Burano island Venice is the Baldassare Galuppi square, the only square of the island, titled to the famous composer of the 18th century. You can find San Martino church, the only one in the island. Its belltower is famous due to its slope. This happen because, as most of the sights of Venice, the basements were built on pile dwellings. Inside the church we can find the Crucifixion by Tiepolo (1725). One of the most caractheristic spot of the island is the intersections between 2 canals, where rises the three bridges. They connect three districts of Burano: San Mauro, San Martino sinistro and Via Giudecca. The heart of Burano, Baldassarre Galuppi square. Burano island Venice is known for the handmade production of laces and for its intense color of the houses, but we are still not sure of the origin of this. The theory says that every colour should be the symbol of a specific family, as in Burano you can find few last names. Another theory says that the intense color was used by boatmen to distinguish their houses with the fog, that is very thick in this island. During the Kingdom of Italy, if someone wanted to change the colour of his own house, he has to ask for permission to the administration. Something typical of Burano is the bussolà, a biscuit made of eggs, flour and butter and with a shape of “S“. 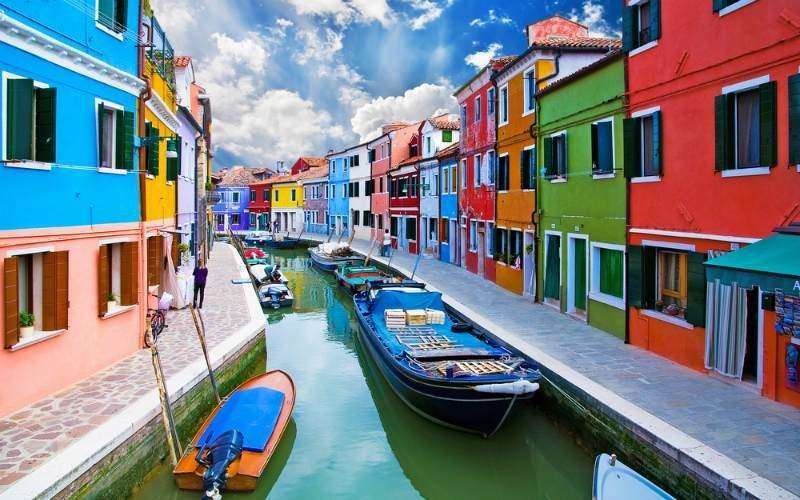 Burano is famous for the handmade production of laces and its intense color of the houses. Ask to the reception for your excursion to Burano!